Char Davies' Immersive Virtual Art and the Essence of Spatiality explores spatiality through a broad range of disciplines, including philosophy, mythology, biology, and visual studies, in order to familiarize the reader with virtual-reality art — how it differs from traditional artistic media and why immersive virtual art promises to expand our imaginative horizons. This original study is an important exposition of two of Char Davies' acclaimed projects and an exploration of the impact of digital virtual art on our world views. What Is Immersive Virtual Art? This book is about the impact of Canadian artist Char Davies' immersive virtual art and the powerful dynamics encountered by people when they experience it. Never before in history have artists presented their art in immersive virtual environments, and never again will viewing 2D art be the same. In this book I concentrate not only on the aesthetics of Davies' digital art but also on the phenomenon of the spatiality in which not only the art forms but we, the participants, float. Immersive virtual art is an emerging technological art form that, in effect, immerses participants in virtual space in the same way as scuba divers immerse themselves in water to explore another world. In fact, her experience of scuba diving was Char Davies' inspiration for creating the body vest, a novel interface between viewer and computer which measures bodily responses and allows immersants to control their journeys within the artwork itself. In the ocean, divers float between flora and fauna, with fish swimming toward them and vice versa. In the case of immersive virtual art, one finds oneself inside a mesmerizing spatiality that one also 'swims in,' where images float toward and through the imrnersant, and the immersant floats toward and through them, in what could be thought of as an interactive spatial ballet. Since immersive virtual art is a relatively new phenomenon that many people have not yet experienced, I invite uninitiated readers to take the time to log on to Char Davies' website at http://www.immersence.com, where they can familiarize themselves in more detail with the type of equipment that is used to experience this art and see what the installations look like when the work is exhibited in public venues such as art galleries or museums. On the website, one can also see the real-time images an immersant sees during immersion and video clips of flythroughs of Osmose and Ephémère. On my own website http://www.mcrobert.org, I have provided links to data mentioned in the book that could not be included here. For readers who understand the technology used to create immersive virtual art and to experience it, I invite them to skip the sections where I discuss this; for those who do not, I begin with the following introduction. In 1965 Ivan E. Sutherland gave a seminal paper entitled 'The Ultimate Display,' which laid out the fundamental principles for a future virtual environment display system 'to serve as a looking-glass into the mathematical wonderland constructed in computer memory. He also developed models of his innovative display system. Some years later, between the years 1985 and 1990, the principal project team at NASA Ames Research Center conceived, created, and developed what is now popularly referred to as a 'headmounted display,' or HMD. Their 'objective was to develop a multisensory virtual environment workstation for use in Space Station teleoperation, telepresence and automation activities.' More specifically, an HMD is a headmounted, wide-angled, stereoscopic display system powered by a host computer and external hardware, such as graphics and sound synthesizing equipment, to create a digitally immersive space. While the space is generally referred to as virtual reality (VR), I refer to it, as Davies does, as immersive virtual reality. The underlying purpose of an immersive virtual display system is that it complements human sensory and cognitive capabilities, allowing a person to be viscerally interactive in it. Although technologically still in their infancy, there are many varieties of HMDs available today since the use of 3D environments is of tremendous benefit for training military personnel, astronauts, doctors, and other professionals who need to practise difficult procedures safely. Char Davies uses this kind of display technology (as do other digital artists) in order to exhibit her art. The HMD is the vehicle that interfaces with the computer and the immersant, processing the optics, sound, and kinesthetics that constitute her virtual realms (worlds as she initially referred to them). She could have chosen some other system to show her immersive virtual art (see chapter 6, where we discuss the CAVE system), but she believed at the time, and believes even now, that a low-resolution, totally surround 360° HMD system is best suited for her artistic needs. Whereas the visual environments produced by the NASA computerized system are generally explored by a joystick or hand-held game controller, or with a data-glove that feeds back tactile information, Davies uses a body vest to achieve sensory feedback. By measuring immersants' breathing and balance, she allows them to negotiate the immersive virtual environment hands-free and arrives at kinetic results that are unique to her artworks. This method of negotiating immersive virtual space, rather than the typical joystick method, is part of the genius underlying Davies' artwork. This, in combination with her use of spatial ambiguity and semi-transparency in the visuals, is the suspected underlying reason why her immersive virtual art plunges people, within a matter of ten minutes or less, into a reverie or dreamlike state. Osmose (1995) is an immersive, interactive, virtual environment with 3D computer graphics and interactive 3D sound, a stereoscopic head-mounted display and realtime motion tracking based on breathing and balance. Osmose is a space for exploring the perceptual interplay between self and world, i.e. a place for facilitating awareness of one's own self as consciousness embodied in enveloping space. Ephémère's iconography evolved through Davies' long-standing practice as a painter, and, as in Osmose, is grounded in 'nature' as metaphor: archetypal elements of root, rock, and stream etc., recur throughout. In Ephémère, however, this iconographic repertoire is extended to include body organs, blood vessels and bones, suggesting a symbolic correspondence between the chthonic presences of the interior body and the subterranean earth! It is, however, impossible for someone, despite all the written information about the experience, to imagine what one of Davies' immersive virtual is like if they have not experienced it. I strive throughout the book to be as descriptive as possible about the immersive experience, but this is undeniably subjectively coloured; no words can replace an actual immersion in a technologically produced work of art of this kind. As we will read in future chapters, the immersive virtual experience in Davies' work never strands us outside of our bodily feelings in a sense of bodilessness, although it does create in some people feelings of transcendence. Computer created, it is still a space that seeps into us, that we imaginatively relate to and feel, a space in which floating objects are not 'nothing' but something, almost demanding to be touched. Unlike the flora and fauna of the great reefs of the world, which environmentalists hope we do not touch, we do attempt to reach out and touch the 3D virtual phenomena in Davies' art, when we do they just evaporate, disappearing into their digital worlds - touch is not incorporated in Davies' work. In Davies' immersive virtual space we encounter three-dimensionally enveloping representative of landscape and other aspects of the natural world, including the subterranean, filled with semi-abstract, semi-recognizable forms or elements that are translucent and semi-transparent and coalesce to form multi-layered images which appear to be moving and floating toward us as well as through us. Hooked up to a computer through a stereoscopic HMD and a body vest that monitors our breathing and balance, we are locked in a symbiotic relationship with a computer, a relationship that even a person sceptical of technological art would find difficult to condemn (plates BW-16, BW-17). 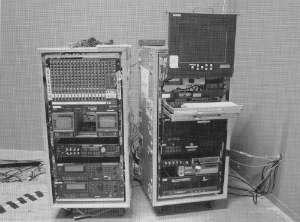 (left) BW-16 Immersant wearing a stereoscopic HMD and breathing/balance interface vest (1995). (right) BW-17 Computer equipment used to run visual and sounds inOsmose and Ephémère. Installation view, Australian Centre for the Moving Image, Melbourne (2003). The visual content of Davies' work, although algorithmically produced, appears organic, soft-edged, and ephemeral, as though constructed out of flowing lines and translucent membranes. This is not because the algorithms producing it are less geometric, as John Harrison, Davies' programmer, points out in the next chapter, but because he has developed the appropriate mathematical equations to create the special effects that Davies desires. As well, the Softimage software used by her artistic designer Georges Mauro has been described as 'the world's most sophisticated visual effects software.' Harrison's innovations to certain parts of the software, further enhanced the effects used in producing Osmose and Ephémère. As good as the software program is when it comes to special features - such as, for example, 'Transparency map,' which determines which parts of the image will remain visible and which will not, allowing for the diffusion of edges and blurring of lines - it is Davies' and her team's specialized use of it, and Harrison's customized programming, that creates the special effects in her artwork. As well, she has employed the software tools in ways which subvert or circumvent their conventional use, one that generally strives for hard-edged, opaque photorealism. This unpacking of traditional uses of geometrical space/time is an important aspect in Davies' digital art, and foundational for my argument. I theorize that what can change in an individual's perspective after immersion in Davies' art-works is a perspective toward space and time and that an experience of this calibre can evoke innate feelings of space and time (plate C-7). C-7 Semi-transparent Trees in Winter Swamp, Ephémère (1998). Digital still captured in real-time through HMD. Like falling deeply into the space of love, so too can we fall into the depths of feelings in our own biological space when we find ourselves encompassed by Davies' digitalized, cathedral-like worlds. Immersive virtual spatiality, in a virtual environment, therefore, is decidedly not about the commonly held conception of 0-1 digital dynamics and their 'roll' through computer-linked cyberspace. Not that immersive virtual spaces are being perceived as having no place in cyberspace - there are people engaged in designing primal virtual spaces that might turn out to adequately represent sacred spaces in cyberspace forums. Rather, it is about opening up new horizons for philosophizing, not through concepts, once thought by philosophers such as Hegel as fated to sublate images, but through the very power of images. Cyberspace is a quite different, more controlled, experience of space ranging from manipulative MUD rooms to informative forums. In contrast, being in the midst of Davies' immersive virtual environments allows one to experience a sense of space, as I argue in the book, that exists in the very depths of our DNA. 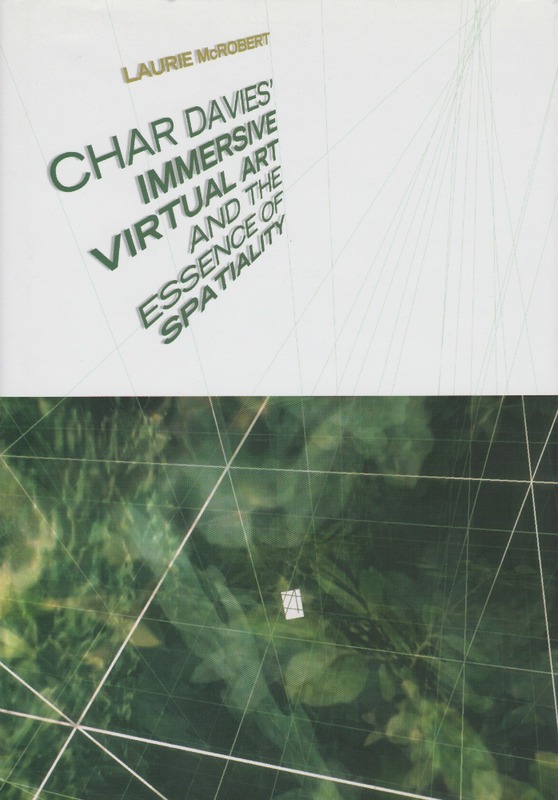 It would be misleading to refer to Davies' immersive virtual art, with its encompassing, ethereal 3D virtual spaces, by using the word cyberspace - a concept we will discuss again in chapter 2. Instead, we must use new terminology to identify it, and that is why the term immersive virtual space is now beginning to be used among technology-based artists and theorists when describing such art. Davies herself coined the neologism 'immersant,' an offshoot of the word immersion, thus introducing a convenient way of referring to people who have participated in her artworks. Differing radically from the more conventional example of 3D virtual reality art produced by designers and artists, who tend to structure their environments geometrically, Davies' immersive virtual art is really in a separate category. Many technological artists use digital space to create 'architectonically' structured worlds which visually confirm what one artist has referred to as 'patterns of space in the mind.' Essentially, however, these worldviews are still based on geometrical and mathematical laws that more often than not resort to a play around mathematically iterated images. What is new about Davies' immersive virtual art is that, among other things, it explores techniques based on transparency and non-linear dynamics that break through our once iron-clad imaginative obsession with Euclidean geometry, and hence through our mathematically rigid conceptions of space/time. Canadian-born Char Davies studied liberal arts, including visual art, philosophy, religion, anthropology, and biology at Bennington College, Vermont, from 1973 to 1975, and received a Bachelor of Fine Arts degree in 1978 from the University of Victoria, British Columbia, the same university that would bestow on her an Honorary Doctorate of Fine Arts in 2002. In the decade following her undergraduate degree, she developed her own symbolic language and aesthetics, which manifested themselves in her paintings. During the 1980s Davies began experimenting with the 3D virtual space of computer technology. At this time she got involved with the fledgling company Softimage, becoming one of its founding directors in 1987. The company became one of the world's leading developers of 3D animation software, which was used for special effects in Hollywood films such as Jurassic Park and The Matrix. In 1996, she began working on her next immersive virtual environment, Ephémère, becoming its executive producer through her own company Immersence when her professional relationship with Softimage ended in 1997. Ephémère premiered at the National Gallery of Canada in 1998 and was subsequently exhibited at the San Francisco Museum of Modern Art in 2001, as well as in Perth in 2002 and Melbourne in 2003-4. Never idle, Davies chose to take some down time to write a PhD dissertation about the philosophical underpinnings of her own art practice. This degree was granted to her by Plymouth University in February 2005. The 120,000-word doctoral dissertation, entitled 'Landscapes of Ephemeral Embrace: A Painter's Exploration of Immersive Virtual Space as a Medium for Transforming Perception,' was originally begun at the CAIIA Centre for Advanced Inquiry into the Interactive Arts, University of Wales. (It should be noted, however, that although I read and refer to drafts of early versions of it, I did not have access to the final version in time to more fully incorporate and appreciate its developed theoretical concepts in this book.) Presently, Davies is planning her next artistic endeavour, which she hopes will immerse us in a real landscape in real-time. As digital artworks (some suggest the term 'art systems' be used to describe interactive computer artworks) Osmose and Ephémére are replete with familiar, universal dynamics that can be approached from many different academic perspectives. Wound into our study of Davies' immersive virtual art are inquiries that deal with philosophical, psychological, and biological issues, upon which terrain her art encroaches. Because our focus must necessarily be on Osmose and Ephémère, a certain amount of redundancy occurs. It is easy to be repetitious in describing immersive virtual art and so incur the disdain of connoisseurs. On the other hand, one has to remember that many who read this book will want to be thoroughly introduced to an art form they may have heard little or nothing about. I want to make clear in this introduction that technologically based art of this immersive quality is very complex to create, and I do not pretend to be an expert on the subject of its intricate digital algorithmic composition, which is a fascinating study in its own right. This book is not about the actual digital construction of such art, nor how its dynamics are conceived and created digitally, nor what algorithms are used, nor what special effects make up the work. Moreover, readers should also know that artists are not required to be experts in the software programming of the art they create. Rather, they are encouraged to work with software engineers and animators, as Davies has chosen to do, and to envision and direct the virtual art they wish to create, whether they understand its algorithmic substructure or not. Several other points should be underscored in this Introduction. The use of symbolic imagery of nature in Osmose and Ephémère is not meant to evoke 'nature-as-it-is.' Some immersive virtual spaces can be referred to as depicting the virtually real, but the images in Davies' works are hardly meant to be real. They are bound only to the level of symbols, sometimes more literally executed while other times more abstractly. Strictly an artistic rendition of a symbolic nature, they do not, and were never intended to, represent nature-as-it-is. It is important to emphasize that this book is not about art and virtual reality but about art and immersive virtual space, and how the novel experience of experiencing art while 'suspended' in 3D space can change our consciousnesses. Still, the use of natural elements by Davies in her artworks has the potential of grounding us in nature, even helping us appreciate real nature - for we are, after all, part of nature. Davies' artistic intent, however, goes beyond the elements of nature - her artworks, she emphasizes, are meant to depict an osmosis of self/world, interior/exterior, typical ninetheenth- and twentieth-century dichotomies explored by philosophers during this period. Davies is apparently not unaffected by the deconstructionist movement, even though the being-in-the-world she intends is influenced by, as she points out, a Heideggerian 'being-in-the-world.' But whether her intention is merging with nature's inert elements or merging with being-in-the-world of animistic nature is not that relevant here. What counts, in our discussion of her work, is whether osmosis occurs between immersants and the world they feel immersed in. I am thinking here of the philosophical sense of 'transcendence,' those longings for another world, for an 'unknown God' - so poignantly written about by poets and religious mystics throughout the ages - and how they compare with the feelings produced by the digital nature of transcendence. Will computer-generated art, with its 3D immersive virtual scenarios, allow us to penetrate the mysteries of a transcendent experience most of us never before hoped to obtain, let alone aspired to know, in some new way? Or do we fool ourselves when we contemplate grasping such a grandiose notion as a biological sense of transcendence through a medium such as immersive virtual art? Questions of this order first surfaced for me as I contemplated certain presenters' artistic endeavours at the 1995 International Symposium for Electric Art (ISEA) proceedings. These questions are still valid for me today, and in the second chapter I examine some of them. My thesis in this book is that immersive virtual art such as Davies' is fated to act positively and catalytically on the human psyche, to bring us face to face with an experience of space/time that we intuitively know but had no way of consciously accessing until now. I argue that being immersed in a virtual 3D spatiality allows us to grasp and understand, as never before, the power of the unconscious. Immersive virtual art such as Davies' acts as a facilitating medium that allows us to appreciate something more than our mathematically conditioned, four-dimensional experience of space and time and takes us deep into our DNA and an innate sense of an archaic/eternal space/time. Does such immersive virtual art succeed because it permits us to familiarize ourselves and to become comfortable with a non-verbal, dreamlike spatiality? Renowned physicist Steven Weinberg points out, in respect to our Einsteinian and quantum constructions of space/time, that we are imaginatively constrained by these mathematical notions. He asks, 'How can we get the ideas we need to describe a realm where all intuitions derived from life in space-time become inapplicable?' Namely, how do we get beyond our present intuitions of space/time and move forward imaginatively into another dimension of spacetime? And here I mean for us to interpret intuition not as an abstract philosophical concept but as one that is biologically founded. Inspired by Davies' art and how it can help us to integrate our bodily feelings with space and time, I will be asking important questions in some of the later chapters that are related to the body's biochemical responses by considering the effect of immersive images on the visual brain. Can such art, by employing three-dimensional computer-imaging techniques, control or manipulate our visionary brain in some specific way yet unknown to us? Can such work produce biochemical by-products in the brain that affect consciousness? Does Davies' art, with its immersive virtual spatiality, provide us with an atmosphere more attuned to the spatial dimensions that we find in dream space? Will deriving 'new intuitions' about space and time that transcend Einsteinian paradigms of relativistic space and time provide us with a way of better understanding the unconscious dimensions of our psyches? LAURlE MCROBERT is an independent scholar and a former lecturer in the Department of Philosophy at McGill University and the Thomas More institute for Adult Education. 1. Ivan E. Sutherland, 'The Ultimate Display,' proceeding of the International Federation of Information Processing Congress (IFIP), vol.2, 1965, 506-8. http://www.cise.ufl.edu/~lok/teaching/dcvef05/papers/ultimate_display.html (accessed 16 November 2005). 2. Brenda Laurel, ed., The Art of Human Computer Inferface Design (New York: Addison-Wesley, 1991). See Scott S. Fischer's article entitled 'Virtual Interface Environments,' where he lists the team members as C. Coler, S. Fischer, M.McGreevy, W.Robinett, and E.Wenzel. The supporting team at Serling Software consited of S. Bryson, J. Humphries, R. Jacoby, D. Kaiser, D. Kerr, and P. Stone (424). 3. It should be noted that Davies has come to value the 'low-resolution' quality of the images produced through the screens of the HMD helmets she began using in 1994. She believes that the resulting softness or lack of detail causes the immersants to let go of their habitual reliance on sharly focused vision and begin to 'feel' space instead. She has stated to me that if she were to use HMDs with a much higher image resolution, she would no doubt add a 'compensatory' softening filter. 4. Laurel, Art of Human Computer Interface Design 430, 431. 5.Quoted from www.immersence.com's home page when Osmose is accessed. Readers should note that Davies' words on her Web page are changed from time to time and might not be phrased exactly as I have written them here. 6. Quoted from www.immersence.com's home page when Ephémère is accessed. 7. Anthony Rossano, Inside Softimage 3D (Indianapolis, IN: New Riders Publishing, 1998), chap. 1. 8. Ibid., front outside cover. 10.Bliss Carman, Editor-in-Chief, The world's Best Poetry, 5 vols. (New York: Bigelow, Smith, 1904), Elizabeth Barrett Browning's Sonnets from the Portuguese, vol. 1, 381. 11. McCagie Brooks Rogers is presently developing Mythseeker software that will immerse people in what he calls 'primal virtual space' - a kind of 'sacred space' he describes as 'an ultimate cosmic intelligence' - through interactive depth systems that explore Egyptian, Greek, shamanic, and other mythologies. The program is designed so that this interaction happens through personal encounters and enactments with well-known mythic agents. These enactments are envisioned as dreamlike experiences in primal virtual space that will allow the immersant to renew and revise her personl myth in a positive manner. For more information, see http://www.mythseeker.com. 12.Linda Candy and Ernest Edmonds, eds, Explorations in Art and Technology (London: Springer, 2002); see 197, 107, 173, 200-1. 16. Steven Weinberg, 'A Unified Physics by 2050,' Scientific American, December 1999. 17. Stephen Wolfram is a controversial physicist who claims that the patterns we see in nature prevail throughout all of it, including the brain, and spring from the same universal computational processes. His A New Kind of Science (New York: Wolfram Media 2002) is a monumental work, replete with pages of computational images of patterns of algorithms rather than formulas. Simply put, his claims that what the book has to say requires a fairly major shift in intuition and thinking. 1984. Behind the Veil (painting). Solo exhibition. Powerhouse Gallery, Montreal, Canada. 1987. Espaces Entrelacés (painting). Solo exhibition. Powerhouse Gallery, Montreal, Canada. 1990. Vision Interface: Through the Medium of the Computer. Anna Leonowens Gallery, Novo Scotia School of Art and Design, Halifax, Canada. 1992. 3rd International Symposium on Electronic Art. Ivan Dougherty Gallery, Sydney, Australia. 1993. State of the Image, New Tendencies in the Field of the Image. Centrum voor Beeldcultur, Antwerp, Belgium. 1993. The New Images, Montage '93: International Festival of the Image. George Eastman House, Rochester, USA. 1993. Prix Ars Electronica. Landesmuseum, Linz, Austria. 1995. Image Electronic. Euphrat Museum of Art, Cupertino, USA. 1995. Osmose. Solo exhibition. Musée d'art contemporain, Montreal, Canada. Publication. 1995. Osmose, Code.Ricco-Maresca Gallery, New york City, USA. 1996-7. Osmose, Serious Games. Laing Art Gallery, Newcastle-upon-Tyne, UK. Publication. 1997. Osmose, Serious Games. Barbican Art Gallery, London, UK. 1997. Osmose, Art Virtual Realidad Plural. Museum of Monterrey, Mexico. Publication. 1998. Ephémère. Solo exhibition. National Gallery of Canada, Ottawa, Canada. Publication. 2001. Osmose and Ephémère, 010101: Art in Technological Times. San Francisco Museum of Modern Art, San Francisco, USA. Publication. 2002. Osmose and Ephémère, Biennale of Electronic Art: Immersion. John Curtin Gallery, Perth, Australia. 2003-4. Osmose and Ephémère, Transfigure. Australian Centre for the Moving Image (ACMI), Melbourne, Australia. Last verified: October 28th 2013.